After many weeks of development and testing, we are very pleased to announce that forums are now available as a new type of pages for your website. The forums allow your visitors to start discussions on your website and to participate in existing discussions. By letting your visitors interact more freely with your website, a new dynamic is introduced. It gives your website even more potential to stand out. Login to your website, and go to the "Pages" tab. Click on "Add Pages to your website"
Your visitors can start new discussions and post answers to other discussions. You, another website administrator or an intranet member with enough access rights can moderate the forums, including updating posts or deleting entire conversations. Discussions are organized in topics. 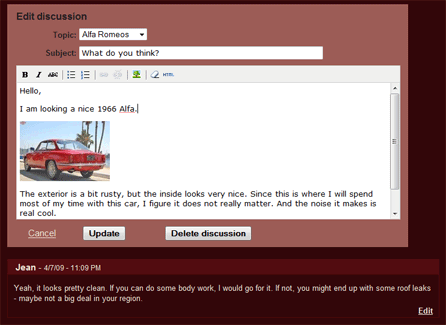 One default topic is created at first, and you can create additional topics to better organize your forum at any time. Unfortunately forums cannot be left alone on the internet: they need to be moderated to protect you from all kind of annoyances (spammers and trolls) and from the occasional typo. Individual answers can be moderated as well. The users tab actually provides the same functionality as the Intranet tab, at the exception that it does not allow for the management of users groups. Users listed there are granted the default "write" rights to the forums. You can deactivate users (the user will not be able to login to the forums anymore, and the same email cannot be used to create another account) and you can delete them as well (the same email can then be used to create a new account). Deactivated users can be reactivated later on, deleted users cannot be recovered. You can protect the forums from being publicly available, and grant read or write access only to members of your intranet. Invite Intranet members to become moderators of your forum, so that they can update and delete conversations even if they are not administrators of your website. Create your own password protected space on the internet, where only people you know and trust can interact. Forums are available now at no extra cost for all planB and planC websites (compare plans). Important note: if you are using a custom design for your website and want to add a forum, contact us so that we can work the details of the extra css file that is needed for the forums.